I’ve been making a few recipes out of the veganomicon, although not vegan myself I’ve been been modifying the recipes and trying to make them a little lower in energy per serving. Below is my modification of the Moussaka recipe on page 165 of the veganomicon which I might say is very tasty in it’s own right but a little to high in energy. 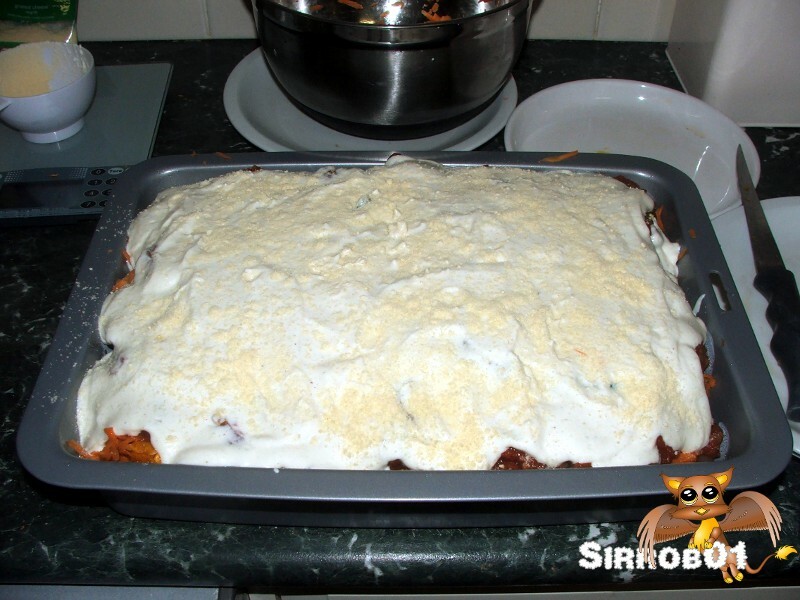 Mainly due to the inclusion of pine nuts and about 750g (1.5 pounds) of potato. First up this is not a quick recipe to make, so far every time I’ve made it, it has taken me a good 2 hours of time. Although not 2 hours solid in the kitchen about an hour on prep and 45 mins to bake. It does however make about 10 servings, so its good for meals for a week or if you’ve got people coming for dinner. If I’m serving it for others we’ll add a simple salad to the side, if it’s just myself and my wife we’ll have just the Moussaka. 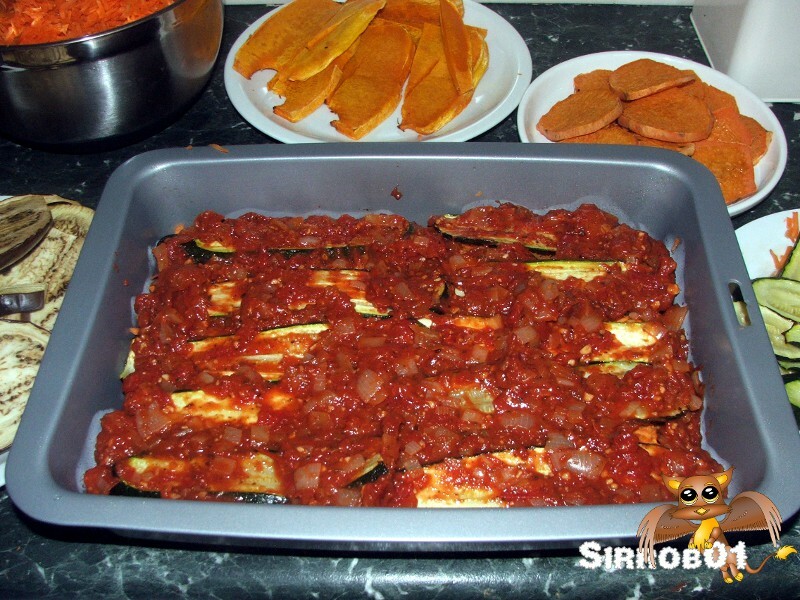 Preheat the oven to 200 C (400F) then cut the tops and bottoms of the eggplant and zucchini and slice them into 1/2 to 3/4 cm (1/4inch) thick slices length ways. 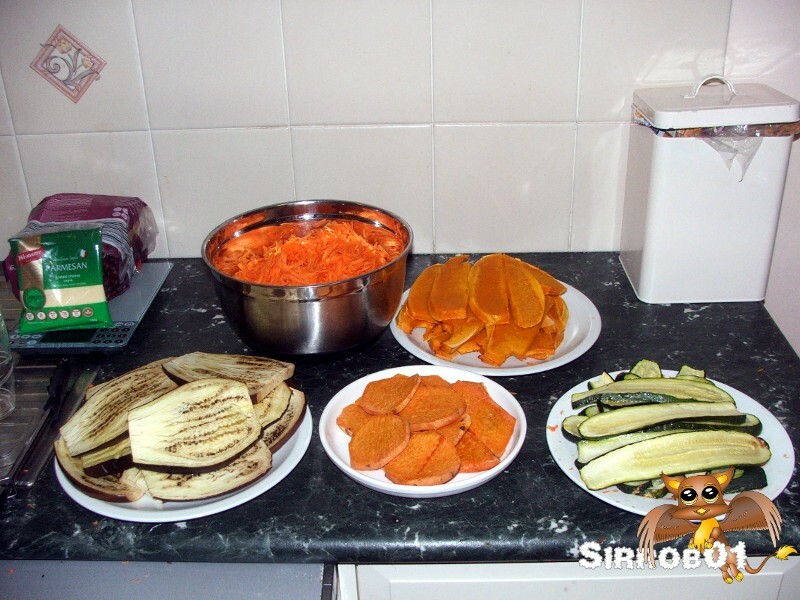 Next up peel the pumpkin and sweet potato and cut them into slices about the same thickness as the zucchini and eggplant. Place all the cut vegies on trays on greaseproof/baking paper (saves using oil) and either spray the tops with olive spray oil or brush very lightly with olive oil (1/8 cup). 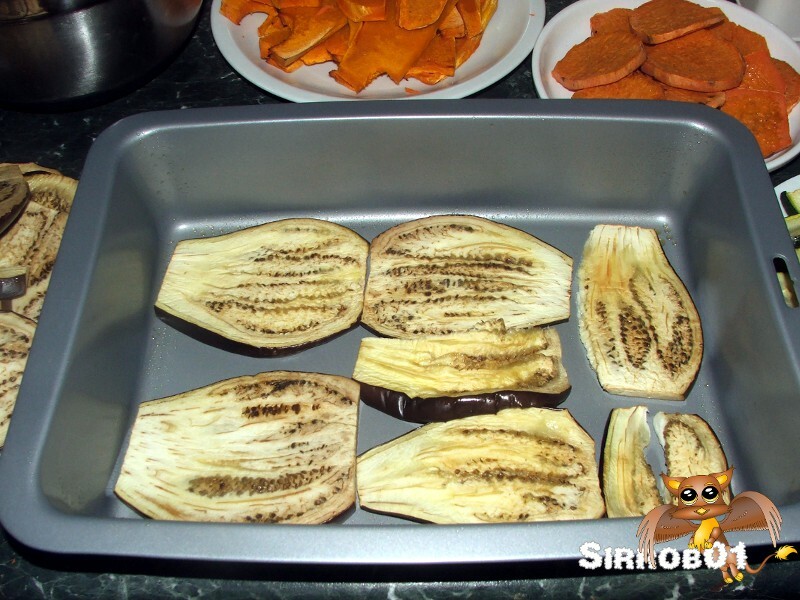 Place these trays in the oven and cook the zucchini and eggplant for 15-20mins and the potato and pumpkin for 20-25mins, try not to over roast them. 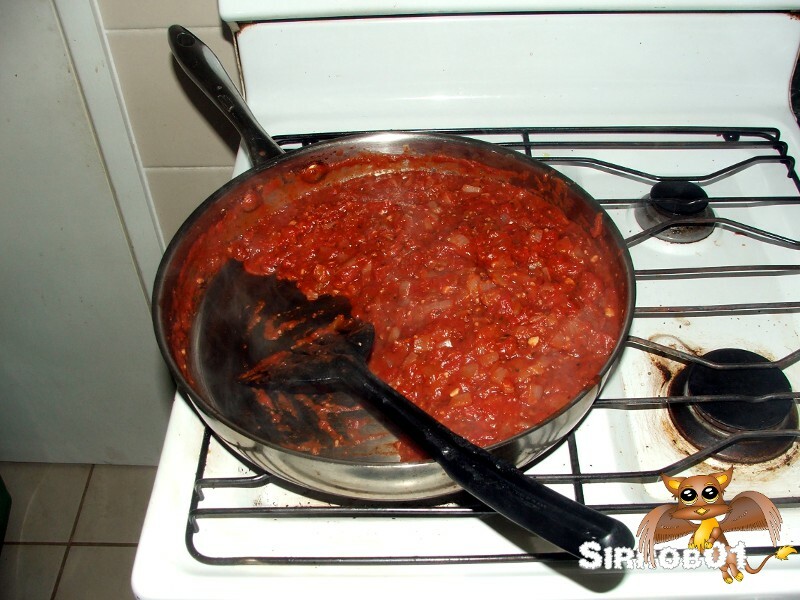 While the vegetables are roasting you can make the tomato(red) sauce. In a frypan place the 1/4 cup of water, 4 cloves of crushed garlic and onion, gently fry this until the onion is cooked about when all the water is evaporated. Next add the 3 cans of crushed tomato, Oregano, Cinnamon, 1/3 cup veg stock and Guar gum. Gently simmer all this for 15-20mins until it begins to thicken then add the last teaspoon of dry veg stock and cook for about 5 more mins. When done simply turn off the heat, don’t forget to check on your vegetables while doing this step 🙂 . I should say slowly add all the ingredients together and mix, but honestly just stick them all in a blender and blend until you have a smooth white sauce. Don’t worry to much if you don’t have enough for a full 2nd layer, just layer them the best you can. Next place the roasting pan in the oven on 200 c (400 F) for 40-50 mins until the top starts to go golden brown. 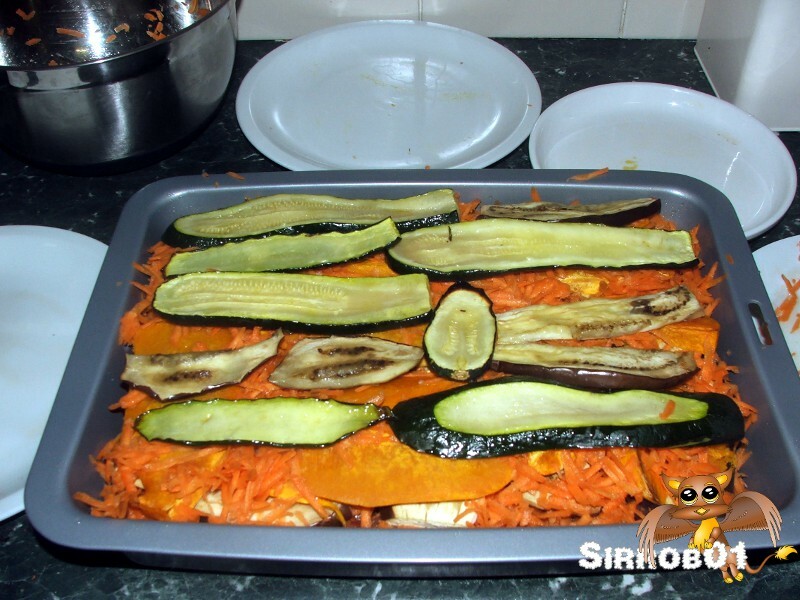 Once ready remove from the oven and allow to cool for 10-15 mins and then cut into 8-12 serves. 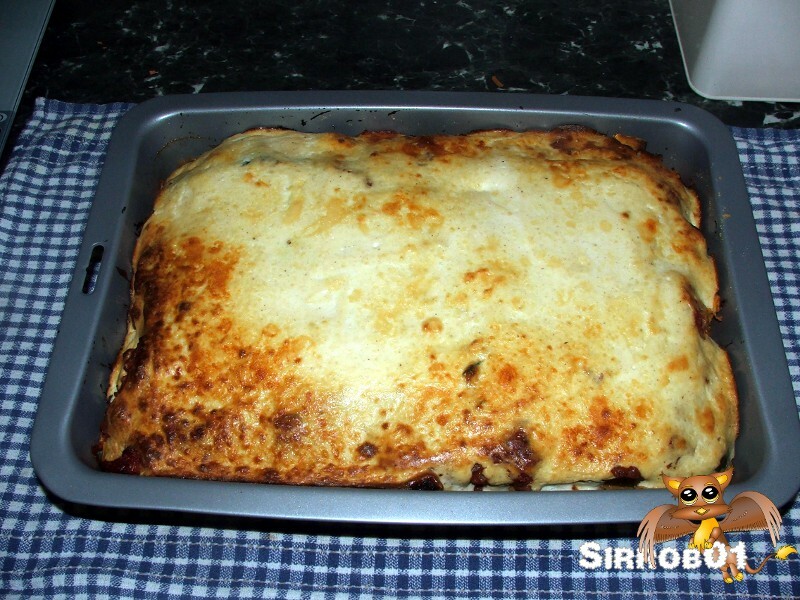 I roughly calculated the energy and fat in the whole Moussaka which is 13000 kj (3100 cal) and 80 grams of fat. A 1/10 serve is 1300kj and 8 grams of fat. 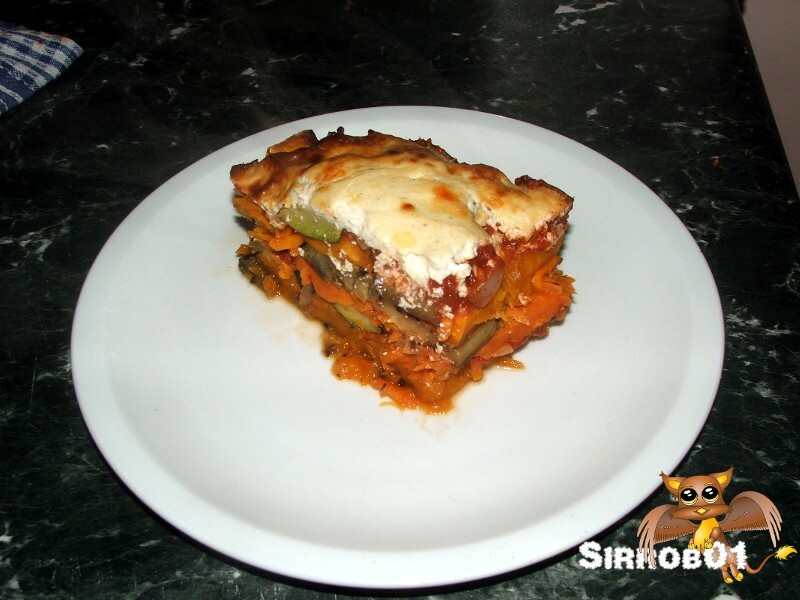 If you want to drop some of the energy and fat simply ditch the Parmesan cheese this will decrease the overall energy in the total Moussaka by 800kj and 16grams of fat.